The 55,000-capacity Stadion Śląski is likely to generate up to $3 million loss annually after it reopens in 2017. With new measures the loss might be reduced by 40% or more. But at a price. Yesterday the regional authorities of Upper Silesia discussed the future of Stadion Śląski. The massive multi-use venue will only be reopened in 2017, but is already certain to represent a large burden on taxpayers. Annual loss of 10-11 million zloty (up to $3m) is forecast, but with latest proposals of its commercialization much of the costs can be covered, reducing loss to $1.5m at best. The new measures were proposed by Evolutio, private company employed to improve Śląski’s potential. 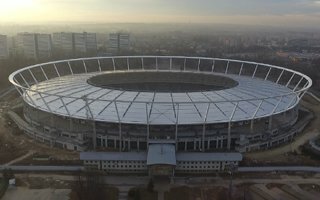 The company, led by previous manager of Stadion Narodowy Marcin Herra, suggested several significant changes both to image and use of the stadium. Perhaps most visible one would be a LED outer skin which would enhance event experience and become a new advertising space. Viewing deck on top of the roof’s upper ring might also be created, allowing visitors to zip-line down at an additional fee. Further spaces for museum(s), leisure and sports fields were also suggested to make the stadium an attractive location every day. Its position in the vast municipal park in Chorzów should be an advantage, though large parking spaces need to be created around the site. Altogether, including upgrade to the east-grandstand’s hotel to 4 stars, the plan might cost 35 million zloty ($8.5m) or more to introduce. Compared to the building’s price so far (certainly in excess of 600 million / $145m), this seems like a rational option. Thanks to its running track, Śląski will become Poland’s largest athletics stadium (almost 55,000) and open-air concert stage (up to 90,000). Considering that Ruch Chorzów persist on playing there, it would also become the grandest league stadium domestically. But none of the above means it will have a large occupancy rate. Athletic events are hardly popular, competition for hosting concerts is huge among new Polish stadiums, while Ruch isn’t able to fill the stadium even in 50%, despite club president’s claims that he “has a plan”. That’s why Evolutio proposed to change planned seating layout to a multicolour mosaic, which would decrease the negative visual impact of empty seats. Alternatively, section of the stadium might be tarped-off.